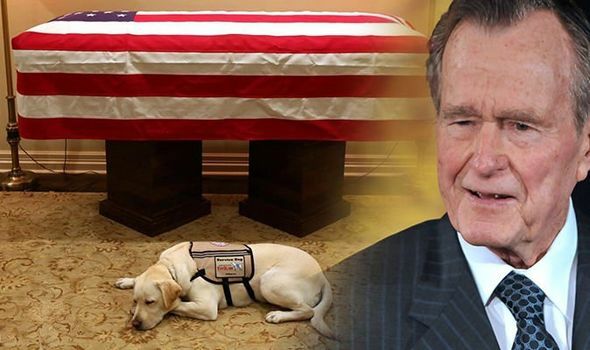 AN EMOTIONAL photo of George HW Bush’s dog Sully lying next to his master’s coffin has touched America as the nation prepares to say goodbye to their former president. The image, which was posted on the dog’s own Instagram account and reposted by the 41st President’s son George W Bush, who was the 43rd President, shows the labrador lying in faithful vigil by the side of his owner. Bush Jnr spoke of the joy the service dog, called Sully, brought his father late in life and how much the family will miss him. He said: “As much as our family is going to miss this dog, we’re comforted to know he’ll bring the same joy to his new home, Walter Reed, that he brought to 41.” Sully helped Bush Snr carry out everyday tasks including opening doors, picking up items and even on occasions attempting to answer the phone. Mr Bush, who died over the weekend aged 94, had a form of Parkinson’s disease. His dog is named after the heroic pilot Chesley B “Sully” Sullenberger III who landed a plane on the Hudson River in New York saving all 155 people on board eight years ago. Sully, a service dog, was given to Mr Bush by VetDogs earlier this year after his wife, Barbara Bush, died. A caption alongside the original Instagram post on Sully’s official account read “Mission complete” as the dog prepares to go back to VetDogs to be re-homed with the Walter Reed National Military Medical Centre’s Facility Dog Programme which helps other veterans. Before then, Sully will travel with the coffin as it flies from Mr Bush’s home to Washington DC on Monday. The body of the former president, who served as US leader from 1989-1993, will lie in state at the US Capitol building as Americans line up to pay their respects.